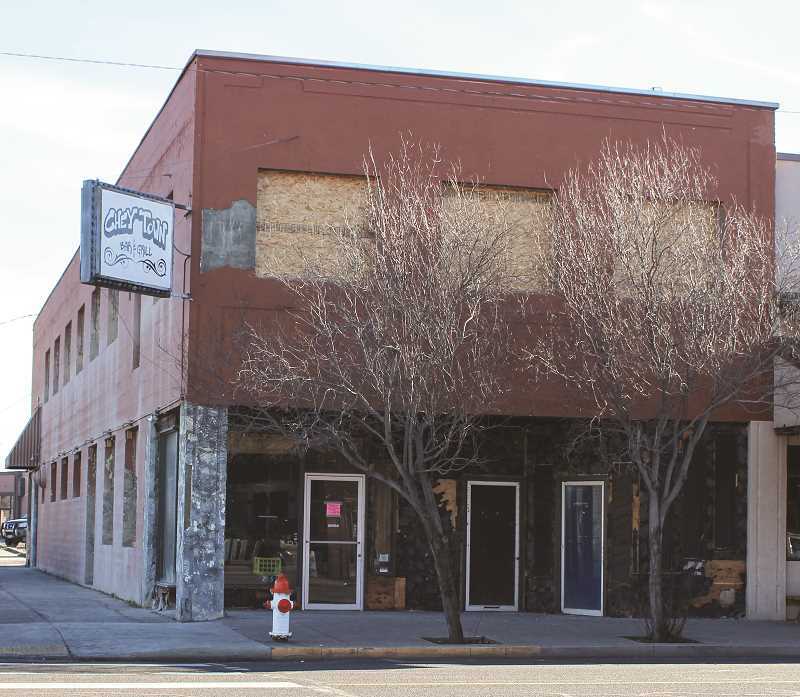 Anyone who's traveled on North Main Street in Prineville recently may have noticed some renovations happening at the old Empire Room at Fourth and Main. The 1940s-era building that once housed a popular lounge and upstairs dance hall is being converted into a café downstairs and three apartments upstairs. The owners would like to be able to open this fall. Terrebonne residents Neal and Kristy Cross and their son and daughter-in-law, Colton and Michelle Cross, of Redmond, purchased the 6,453-square-foot building in 2017. Previously, Chey Town Bar and Grill occupied the space for a short time, but once that went out of business several years ago, the building has remained vacant. Neal and Kristy have operated One Street Down Café in Redmond for 10 years and plan to open a similar eatery at the Prineville location under the name 386 Main Café, a nod to the address but also what they call a cool, simple name that some young people suggested. Josh Bennett, who has been chef at One Street Down Café since the fall of 2017, plans to be the chef at the new café and is the prospective business owner as well. The Cross family hasn't always been in the restaurant industry. Neal was in the military, and the family of six traveled and moved often. In each new town, they would always find their special café. "When the kids started getting older, we'd take the napkins, and we would draw what ours would look like," Kristy recalls fondly. "Kind of a family vision." When their four children were done with high school, they wanted to open a family restaurant. Twelve years ago, they purchased an old home that most recently had served as a dentist's office on Seventh Street in downtown Redmond. Neal, who had gotten into the construction business, renovated the building. They opened One Street Down Café 10 years ago, and their two daughters helped run it until they began starting families of their own. "They're gone," Kristy laughs, "and here I am." Always on the lookout for another renovation project, the Cross family discovered the vacant building on North Main Street in Prineville. "We really bought the building because it was a cool building, and then since there's a restaurant, we talked to Josh to see if he'd want to jump over there and grab onto it," Kristy said, adding that old buildings have a nice atmosphere. Bennett said the new café will be an elaboration of One Street Down, in a way, but its own separate entity. "It's a bigger space. It'll have a full bar, more or less, but it will still be the brunch all day every day," he said. "We'll take some of the menu items from One Street and bring them over to Prineville, but we'll also expand to different items as well, just to cater to the community." They'll most likely be open for breakfast and lunch daily from 7 a.m. to 3 p.m. and will serve what Bennett calls unique American comfort food. "We'll do more upscale breakfast and lunch items, a notch up from your normal Mom and Pop type operations," Bennett said. "We'll do specialty coffees, specialty breakfast cocktails." He's hoping to work with neighboring Ochoco Brewing Company to sell some of their beers. Bennett, of Tumalo, graduated from Cascade Culinary Institute in 2001 and has worked in the Central Oregon restaurant industry for 20 years. "He's super good. He won't tell you that," Kristy said, complementing her chef. "I haven't worked with anybody better as far as a chef goes." They will most likely hire between eight and 10 people to operate the new café. The building will look completely different both inside and out once the renovations are complete. So far, Neal and Colton have gutted the building, cut the concrete, cut spaces for bigger windows, and cut a door on Fourth Street, where they plan to offer patio seating. "It'll be wide open and kind of an industrial look inside and same with the outside," Kristy said. "The awnings will be metal, there will be old tin lights, so industrial modern." She said the top floor will feature three very nice apartments with tall ceilings, and they've kept the original Douglas fir dance floor. They envision renting the apartments to data center workers. Additionally, they are creating a small office space downstairs out of what may have been a poker room at one time, and they already have a renter for that space. The new owners look forward to opening a café in Prineville but ask the community to be patient while they get all of the pieces in place. "We're excited to come to Prineville and be able to offer something new and quality in a comfortable space for people and to help that little corner of the downtown as well," Bennett said.